One of the reasons for this blogs existence is to monitor potential patterns in my hobby output. Something that has come to light over the last couple of years is that the August/September period tends to disrupt my toy soldier focus, for numerous disparate reasons. 2012 is following that pattern. With that in mind updates around here might be a bit more sporadic for a little while. On the other hand I may be inspired this evening and start churning painted figures out, who knows? The main thing is that I cant guarantee a worthwhile weekly update at the moment, although I am hopeful to be back on track within a couple of weeks. L to R: Blood Bowl 3rd ed, Blood Bowl 3rd ed, Blood Bowl 3rd ed with added base, Blood Bowl 2nd ed with added base. I turn thirty-seven next week. Perhaps I should have outgrown amusing myself with headings like the one above by now. I remain entertained nonetheless. The balls in question are for use with Blood Bowl, in case that isnt obvious. L to R: Dungeonbowl spiked ball, Blood Bowl 2nd ed ball with base (green for unclear reasons), a scratch built bomb, a “Ball Squig” (originally a RT ork squig), Blood Bowl 2nd ed ball (painted blue because its “Enchanted”) and an Iron Ball made from a metal recast of the 3rd ed ball, distributed at the 2003 Blood Bowl. Over the years Blood Bowl has had various rules for playing the game with alternatives to footballs. Largely those rules were not great in my opinion. My regular opponents didnt really want to add the sort of extra random factor that those… ball-ternatives brought to the game. That changed after I had played a lot of Dungeonbowl with SOS/theottovonbismark and MT, so I made up a few of these little models. We used the bomb in a few games and the Ball Squig too. I think that we also used the spiked ball on at least one occasion. 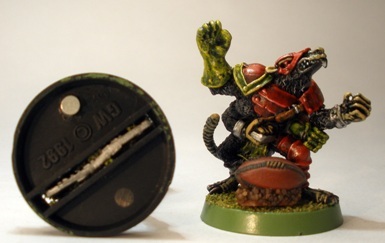 All of the balls have a magnet inserted into the base that corresponds with magnets under the bases of my Blood Bowl teams, as modeled by the skaven mutant above. The odd-balls may make a reappearance in some Dungeonbowl games soon. Maybe. 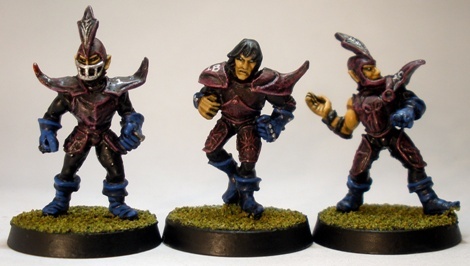 Continuing my Blood Bowl retrospective on from my halflings and skaven its the Munnig Marauders up today. 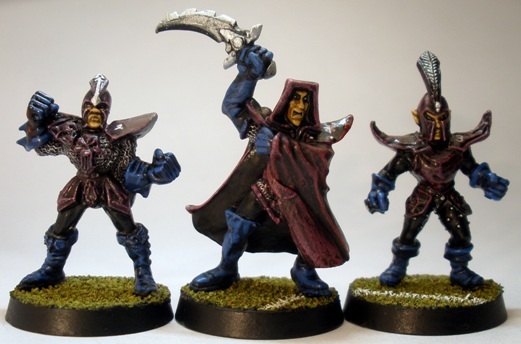 Tuern Redvenom (centre below) models the 2002 Marauders strip. 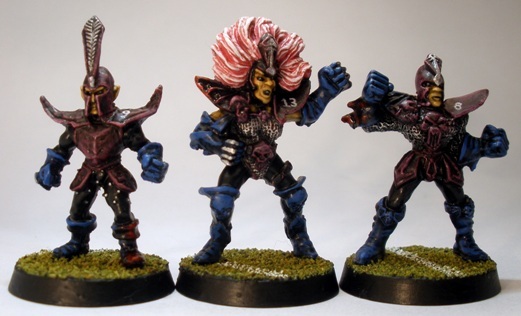 The metal second edition Blood Bowl Dark Elf team was one the first GW 28mm purchases that I made, back in about 1990 I think. They sat unpainted in a box for years. I even ended up adding the third edition team (I cant remember for sure but it was probably to get my hands on BB witch models) and some star players to the box at various points, but the lot remained unassembled. 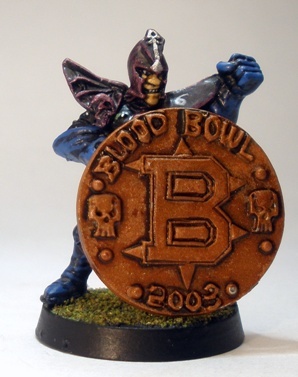 I found myself time rich and cash poor in 2002 and at that time there was some enthusiasm in my gaming group for Blood Bowl. I decided to be less precious about the big pile of BB figures that had been sitting around for an age and churned out a few teams quickly to a tabletop standard lower than my usual painting level. The Marauders were part of that process. The paint job is simple and a little uninspired, but functional. The figures are a mix of second and third edition figures, with the odd very small conversion or two for reasons that I dont remember now (like the second edition blitzer with the head swap in the middle above. He had probably lost his head for some reason back in the early nineties). 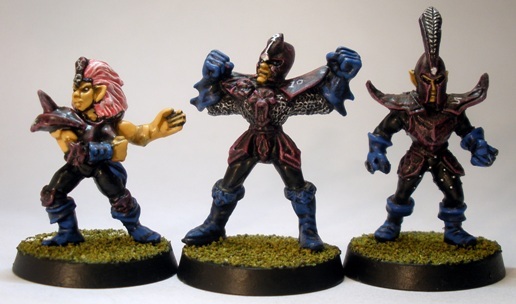 I could never decide whether I liked the Blood Bowl thrower/quarterback type figures to be posed with or without the ball in hand, as it often leads to teams holding several balls, which looks a little daft. Still, when the result of leaving them out is that the player seems to miming carrying a ball (like the thrower on the right above) then I tend to come down on the side of the sculpted on ball. This team got a small bit of play, but the skaven were my go-to team around the same time, so the dark elves didnt get to the pitch/dungeon very often. They did however acquire a number of irritating chips to the paint for reasons unknown. This was doubly annoying as I didnt record the colours used on the armour which meant that covering the chips was going to be very difficult. So I decided to add some blood stains. Funnily enough, the figures with the bloodstains look a little more finished than the others now: the red made them pop a little, even if that may not be immediately apparent from the not so great photos. 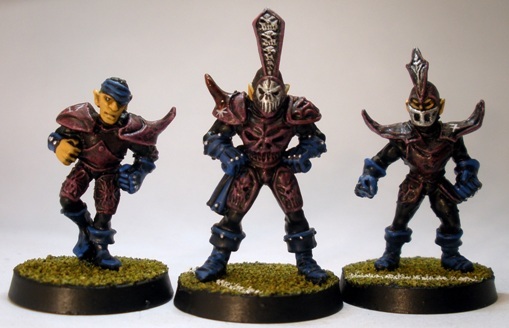 Horkon Heartripper (centre above) has to be one of the weakest Blood Bowl sculpts ever. The candy floss pink hair on the witches turned out well. I have always enjoyed painting pink for some reason. The witch herself is a bit goofy, doing star jumps with that Einstein hairdo. The witch on the left is an old and redundant second edition dark elf catcher given a new lease of life by the addition of a Marauder witch elf head and a pair of green stuff breasts. 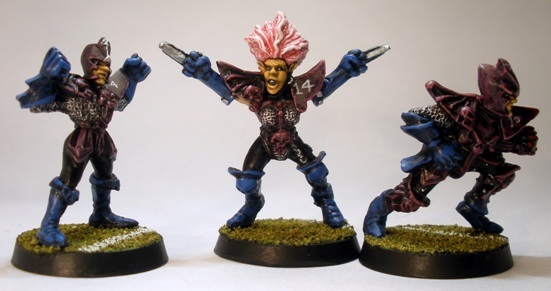 A third witch was needed in case I ever decided to field Roxanna Darknail or some other dark elf star player. I never did, but I tend to be completist with these things.